Each year we gather with family and friends under bursts of red, white, and blue fireworks to celebrate our patriotism in a way that is as unique as our local culture. 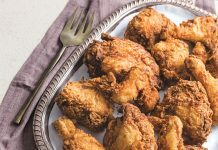 Amid the sharp whistle of bottle rockets and the low crackling of sparklers, cooks across the state prepare meals that are at once all-American and distinctively Louisiana. These Independence Day menus might vary wildly by household—but many prefer to stick to the classics. 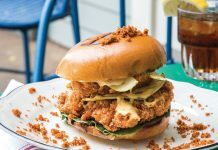 For our midsummer holiday spread, we’ve taken fried chicken and kicked it up a notch with this Cajun-Brined Fried Chicken. Cool apple slaw and creamy four-potato salad make the perfect accompaniments, creating flavorful new takes on basic preparations. Relax with a refreshing rum punch, and follow the meal with melt-in-your mouth blueberry crumb bars. Guests will nominate you as the party’s host for years to come. In a large nonreactive container, combine 1 gallon water, 1 cup salt, and 1 cup Cajun seasoning, stirring until salt dissolves. Add chicken to water mixture. Cover, and refrigerate at least 8 hours or overnight. Preheat oven to 350°. Spray the rack of a broiler pan with nonstick cooking spray; place rack in pan. Set aside. In a large bowl, whisk together remaining ¼ cup salt, remaining ⅓ cup Cajun seasoning, flour, black pepper, and cayenne. In a large bowl, combine buttermilk and hot sauce. Remove chicken from brine; pat dry. Dredge each piece in flour mixture, shaking off excess. Dip floured pieces into buttermilk mixture allowing excess to drip off. Dredge in flour mixture again, shaking off excess. Place on prepared pan. 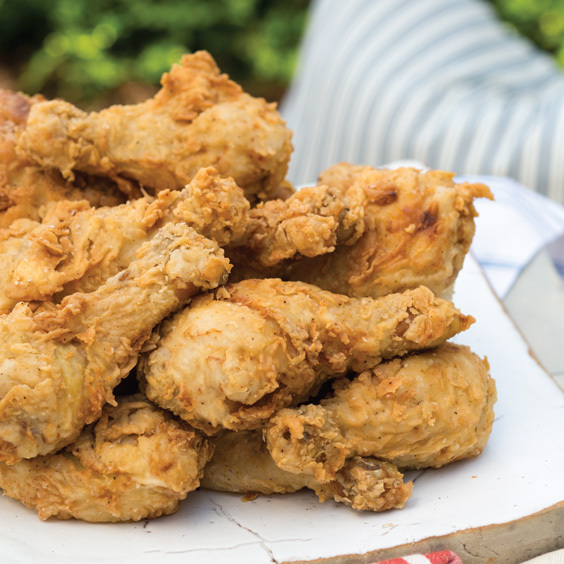 In a large Dutch oven, heat peanut oil over medium-high heat until a candy or deep-fry thermometer reads 350°. Working in batches, cook chicken, turning occasionally, until golden brown on all sides, 5 to 8 minutes. Adjust heat as necessary to maintain 350°. Place chicken on prepared pan. Bake until a meat thermometer inserted in the thickest portion reads 165°, 10 to 12 minutes. what would be your Cajun seasoning recipe? Try Frere Jean. All the wonderful spices without the salt. You can controll the salt! Just wondering should we rince brine off chicken ? Thanks for asking! There’s no need to wash the brine off the chicken. Thanks for asking! First off, you should use whichever Cajun seasoning you like best. And with regards to the overall spiciness of the dish, the black and cayenne pepper are used in the dredging process, so not all of it (not even most) ends up on the chicken. The dish ends up being spicy, but not crazy. I’m confused. Are you frying the chicken in an oven. Then baking it afterwards? Hi Jeff! Yes, fry first then bake. But if you want to shake it up and try something different, let us know what you do and how it goes. 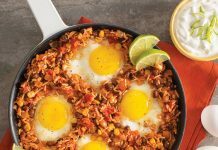 We love to learn how others are using these recipes. Would a half flour / half corn starch mixture work with this? Hi Kevin, it should work for you. However, you may not need the final baking step. Just make sure the meat reaches 165° in the thickest portion of the meat to ensure it’s fully cooked and safe to eat. Let us know how it goes!